Princess Victoria (Vickie Otis) was a Sandy Barr trainee from the Portland area..
Victoria quit the business after her WWF stint (with Velvet McIntryre) and now lives somewhere in the Carolinas..
April 6, 1981 – Vancouver All-Star Wrestling: Princess Victoria & Sandy Barr defeated Terry Adonis & Velvet McIntyre. April 20, 1981 – Vancouver All-Star Wrestling: Princess Victoria vs. Velvet McIntyre ended in a draw. May 30, 1981 – Vancouver All-Star Wrestling: Velvet McIntyre defeated Princess Victoria. June 20, 1981 – Vancouver All-Star Wrestling: Velvet McIntyre defeated Princess Victoria. September 14, 1981 – Vancouver All-Star Wrestling: Velvet McIntyre defeated Princess Victoria. 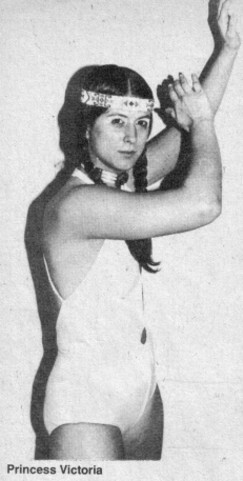 September 21, 1981 – Vancouver All-Star Wrestling: Lone Eagle & Princess Victoria defeated Billy The Kid & Velvet McIntyre. March 13, 1982 – WWF Event: The Fabulous Moolah & Wendi Richter defeated Princess Victoria & Velvet McIntyre. March 14, 1982 – MSG Network: The Fabulous Moolah & Wendi Richter defeated Princess Victoria & Velvet McIntyre. March 28, 1982 – WWF Event: Princess Victoria defeated Wendi Richter. April 20, 1982 – CWF: Princess Victoria defeated Donna Christianello. April 29, 1982 – CSW: Princess Victoria & Sabrina defeated Joyce Grable & Wendi Richter. April 30, 1982 – NWA St. Louis: Victoria & Sabrina defeated Joyce Grable & Wendi Richter. May 14, 1982 – Stampede: Victoria & Sabrina defeated Joyce Grable & Wendi Richter. May 15, 1982 – Stampede: Joyce Grable & Wendi Richter defeated Princess Victoria & Sabrina to retain the NWA World women’s tag titles. May 16, 1982 – Stampede: Princess Victoria defeated Wendi Richter. May 28, 1982 – Stampede: Wendi Richter defeated Princess Victoria. June 19, 1982 – AWA: Princess Victoria & Sabrina defeated Joyce Grable & Wendi Richter. September 5, 1982 – WCCW: Princess Victoria defeated Judy Martin to win the NWA United States women’s title. November 25, 1982 – MSW: Princess Victoria defeated Leilani Kai. December 26, 1982 – WWF Event: The Fabulous Moolah & Wendi Richter defeated Princess Victoria & Sabrina. December 27-30, 1982 – WWF Event: The Fabulous Moolah & Wendi Richter defeated Elizabeth Chase & Princess Victoria. February 12, 1983 – SWCW: Princess Victoria defeated Wendi Richter. 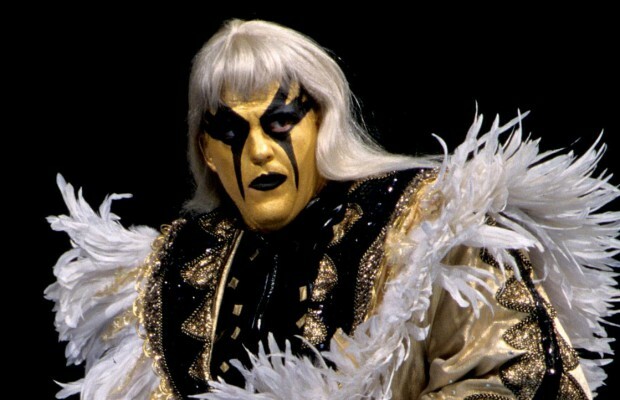 May 21, 1983 – WWF Event: Princess Victoria & Susan Starr defeated Leilani Kai & The Fabulous Moolah. May 25, 1983 – MSG Network: The Fabulous Moolah defeated Princess Victoria to retain the NWA World women’s title. May 28, 1983 – MSG Network: Princess Victoria & Susan Starr defeated Leilani Kai & The Fabulous Moolah. July 10, 1983 – MLW: The Fabulous Moolah defeated Princess Victoria to retain the NWA World women’s title. August 5, 1983 – NWA St. Louis: Bob Brown & Princess Victoria defeated Leilani Kai & Roger Kirby. October 20, 23, 1983 – WCCW: Judy Martin defeated Princess Victoria. October 21, 24, 27, 29, 1983 – WCCW: Princess Victoria defeated Judy Martin. October 28, 1983 – WCCW: Iceman Parsons & Princess Victoria defeated Buddy Roberts & Judy Martin. February 16, 1984 – MSW: Lanny Poffo & Princess Victoria defeated Buddy Landel & Wendi Richter. February 19, 1984 – MSW: Princess Victoria defeated Wendi Richter. Wendi Richter defeated Princess Victoria. February 24, 1984 – MSW Mid-South Wrestling TV: Buddy Landel & Wendi Richter defeated Lanny Poffo & Princess Victoria. March 5, 1984 – CWA: Despina Montagas, Dutch Mantel & Princess Victoria defeated Jimmy Hart, Leilani Kai & Wendi Richter. March 6, 1984 – CWA: Princess Victoria defeated Leilani Kai. March 8, 1984 – CWA: Despina Montagas & Princess Victoria defeated Leilani Kai & Wendi Richter. March 14, 1984 – CWA: Princess Victoria & Scott Shannon defeated Jimmy Hart & Wendi Richter. March 24, 1984 – AWA: Donna Christianello & Wendi Richter defeated Despina Montagas & Princess Victoria. April 1, 6, 1984 – WWF Event: Peggy Lee & Wendi Richter defeated Princess Victoria & Velvet McIntyre. April 4, 7-9, 12-13, 15, 19, 1984 – WWF Event: Princess Victoria & Velvet McIntyre defeated Peggy Lee & Wendi Richter. April 17, 1984 – WWF Championship Wrestling: Princess Victoria & Velvet McIntyre defeated Peggy Lee & Wendi Richter to retain the women’s tag titles. April 17, 1984 – WWF All-American Wrestling: Princess Victoria defeated Wendi Richter. April 21, 1984 – WWF Event: Peggy Lee & Wendi Richter defeated Princess Victoria & Velvet McIntyre. April 23, 1984 – MSG Network: Princess Victoria & Velvet McIntyre defeated Peggy Lee & Wendi Richter to retain the women’s tag titles. April 26-28, 1984 – WWF Event: Princess Victoria & Velvet McIntyre defeated Peggy Lee & Wendi Richter. May 6, 1984 – AWA: Princess Victoria & Velvet McIntyre defeated Donna Christianello & Wendi Richter. May 4-5, 10-11, 13, 16-17, 26, 1984 – AWA: Princess Victoria & Velvet McIntyre defeated Despina Montagas & Leilani Kai. June 16, 1984 – MSW: Princess Victoria & Velvet McIntyre defeated Peggy Lee & Wendi Richter to retain the women’s tag titles. June 25, 1984 – CWF: Judy Martin & Peggy Lee vs. Princess Victoria & Velvet McIntyre ended in a double disqualification. June 26-28, 30, 1984 – CWF: Princess Victoria & Velvet McIntyre defeated Judy Martin & Peggy Lee. July 28, 1984 – WWF On USA Network: Princess Victoria & Velvet McIntyre defeated Peggy Lee & Peggy Patterson to retain the women’s tag titles. July 29, 1984 – WWF Event: Princess Victoria & Velvet McIntyre defeated Peggy Lee & Peggy Patterson. August 4, 1984 – WWF Event: Princess Victoria & Velvet McIntyre defeated Peggy Lee & Peggy Patterson. August 5, 1984 – WWF Event: Princess Victoria & Velvet McIntyre defeated Desiree Peterson & Peggy Lee. August 11, 1984 – WWF Event: Princess Victoria & Velvet McIntyre defeated The Black Sisters (??? & ???). August 29, 1984 – WWF Maple Leaf Wrestling: Despina Montagas & Leilani Kai defeated Princess Victoria & Velvet McIntyre. September 1, 1984 – WWF On PRISM Network: Princess Victoria & Velvet McIntyre defeated Despina Montagas & Leilani Kai to retain the women’s tag titles.